If you do not have Git, after downloading LAMP in either zip or tar formats, you need to extract the archive with unzip or tar command. The programs are written in python (>=2.6) except frequent pattern mining. You set up the LAMP by the following command in lamp/ directory. The details of the arguments, options and input and output formats are described in Usage. Here, we present three examples of running LAMP. First two examples are toy examples, and the last one generates the exactly identical result shown in our paper. We here use two small files in sample/ directory. An example file of item-file. This file contains the associations between 15 genes and four motifs. A sample file of value-file to use Mann-Whitney U-test. The gene orders should be exactly identical to item-file (sample_item.csv). The ternary combination of TFs TF1, TF2 and TF3 is significant. The raw p-value is 0.00602, and the adjusted p-value is 0.0301. The running time is 0.023 sec. in total. The right diagram shows the adjusted P-values related to the significant combination. This diagram can be drawn in the SVG format file sample_u_test_result.txt-flower1.svg by the following command. By changing the file “sample/sample_expression_value.csv” and the option “-p u_test” with “sample/sample_expression_over1.csv” and “-p fisher” in Demonstration 1, you can perform LAMP with Fisher’s exact test. We here use the following two samples in sample/ directory. The example file of item-file. This file is same as the file used in Demonstration 1. A sample file of value-file to use Fisher’s exact test. Expression levels should be “0” or “1”. When the raw p-value <= 0.01 (calculated by 0.05/5), the combination is called significant. There is one significant combination. The ternary combination of TFs TF1, TF2 and TF3 is significant. The raw p-value is 0.00699, and the adjusted p-value is 0.0350. The running time is 0.016 sec. in total. The right diagram shows the adjusted P-values related to the significant combination. This diagram can be drawn in the sample_fisher_result.txt-flower1.svg by the following command. We here show the example of public microarray data analysis. Before performing LAMP, we need to convert the public breast cancer data into file format used in LAMP. The procedure is in Data preparation. This script prints “# Non-redundant combinations” in the first line. The other lines are same as the gse6462_expression_over1_result.txt excepting the elimination of “TATA,NFAT,PAX,AR”. Note that the running time of LAMP depends on the data (not only data size but also density of the data etc.). In the worst case, a few days and more than a hundred gigabytes of memory might be used. In general, the running time of Mann-Whitney U-test is longer than that of Fisher’s exact test. This option selects the p-value calculation procedure. "fisher"; (Fisher's exact test), "chi" (Chi-squared test) or "u_test" (Mann-Whitney U-test) are available. The file that includes associations between TFs and genes. Indicate which alternative hypothesis is used. Select "greater", "less" or "two.sided". The default setting is "greater". Set the maximum arity of the tested combinations. The default setting is no limit. Change the filename to save the running progress. The default setting is lamp_log_[date]_[time].txt. Set LCM program path if you do not use ./lcm53/lcm. the number of permutation test to estimate null distribution. You can use the identical options to LAMP so as to change setting. LAMP generates all significant combinations. However, in some applications, the raw result may be too redundant to be used because two very similar but slightly different combinations are appeared in the results. To support the interpretation of the result, we prepared the script eliminate_comb.py. This script selects the combination which is the most significant in all subsets of the combination. That is, suppose that the combinations A and B are significant, and A has smaller P-value than that of B. When A comprises B or A is comprised by B, the significance of B would be due to A. By using eliminate_comb.py, we remove the combinations such as B from the results of LAMP. When the P-values are equal between A and B, the smaller combination is eliminated. The result file of LAMP. The filename to output the result of this script. [lamp-output-file] is the result file of LAMP. The diagrams are saved to SVG format files named [lamp-output-file]-flower[rank].svg. [rank] corresponds to the “Rank” column in [lamp-output-file]. LAMP receives two input files: item-file and value-file. Their examples are in the sample/ directory. The item-file provides the associations between TFs and their target genes. This file should be formatted according in the CSV format. sample/sample_item.csv is an example. The first line provides the names of TFs. The following lines include the associations between a gene and TFs. The first column indicates the gene name. The other columns indicate whether the TF targets the gene. If the gene is targeted by the TF, the column value is ‘1’. If not, the value is ‘0’. 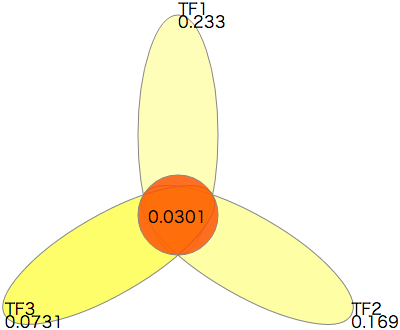 For instance, gene A is target gene of TF1, TF2 and TF3 in the example. sample/sampe_item.csv contains 15 genes and 4 TFs. Thus, the file consists of 16 lines and 5 columns. The value-file provides the gene expressions levels. The file is the CSV format with two columns: the gene name and the expression level. When LAMP derives the p-value using the Mann-Whitney U-test, the expressions levels are any real values. However, when LAMP calculates the p-value using Fisher’s exact test, the expression levels are 1 or 0. If the gene is up-regulated, then the second column is 1. Otherwise, it is 0. The comment lines start with ’#’ and are ignored by the analysis. As examples, we show the content of the sample files. This file is prepared for the Mann-Whitney U-test. The second column takes real values. This file is prepared for Fisher’s exact test. The values in the second column are 1 or 0. This file was generated from samples/sample_expression_value.csv. If the gene expression is higher than 1.0 then expression level is 1. Otherwise, it is 0. Both sample/sampe_expression_value.csv and sample/sampe_expression_over1.csv describe the expressions of 15 genes. The gene orders in the item-file and the value-file should be identical. For example, both sample/sample_item.csv and sample/sample_expression_value.csv consist of 15 genes from gene A to O. If the given gene sets are different or are in a different order, LAMP does not run properly. The number of columns and rows in item-file. The threshold for non-adjusted p-value. The combination is significant when the raw p-value is less than this value. The number of testable combinations. The adjusted p-value is computed by multiplying the raw p-value by this value. The minimum number of target genes targeted by a testable TF combination. The number of significant combinations. The rank ordered by the p-value. The p-value calculated using p-value-procedure. The adjusted p-value. The value of each combination printed by LAMP is smaller than the significance level. If the value is smaller than the inputted significance level, the combination is significant. The significant combination. The TFs are delimited by ’,’ (comma). The number of elements in the combination. The number of target genes of the combination. The value used to compute the p-value. In case of calculation by Fisher’s exact test, the value means the number of genes that are both targeted and up-regulated. In the case of calculation by Mann-Whitney U-test, the value is the z-score. The time to compute the correction term. The time required to calculate the p-values of the testable combinations. LAMP produces an LCM argument file and the LCM result files. One is saved as item-file.4lcm53, and the others are saved in item-file.4lcm53.results/ directory. LAMP is open source code issued under the BSD License. Aika Terada wrote the LAMP code, excluding LCM for enumerating frequent patterns. Takeaki Uno implemented LCM to add the LAMP option for fast computation of the optimal minimum support. The original LCM can be downloaded from Program Codes of Takeaki Uno and Hiroki Arimura. The LAMP is developed through discussions with Jun Sese, Koji Tsuda, and Shin-ichi Minato. We would like to thank Takayuki Itoh for developing the code to draw the flower diagram. Please contact the below address in case you find a bug, need detailed information or need application for different situation and so on. Shin-ichi Minato, Takeaki Uno, Koji Tsuda, Aika Terada, and Jun Sese. A Fast Method of Statistical Assessment for Combinatorial Hypotheses Based on Frequent Itemset Enumeration. In Proceedings of the European Conference on Machine Learning and Principles and Practice of Knowledge Discovery in Databases 2014 (ECML PKDD 2014). Nancy, France. September 15-19, 2014. Aika Terada, Koji Tsuda, and Jun Sese. Fast Westfall-Young permutation procedure for combinatorial regulation discovery. In Proceedings of 2013 IEEE International Conference on Bioinformatics and Biomedicine (BIBM 2013). 153-158. Shanghai, China. December 18-21, 2013. Aika Terada, Mariko Okada-Hatakeyama, Koji Tsuda and Jun Sese. Statistical significance of combinatorial regulations. Proc. Natl. Acad. Sci., vol. 110, no. 32, 12996-13001, August 6, 2013.